The Mrs hit a couple of more home runs with her brisket tonight. She did one trimmed brisket and one un-trimmed brisket just to see if there was much of a moisture difference in the two. Despite all the propaganda to the contrary, I couldn't tell any major difference. 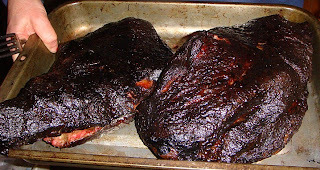 Both were smokey, moist, tender, and flavorful. No marinade on these, either, and they were just as tender as those she marinated last time. 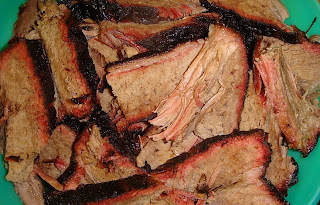 I think the bottom line is, low and slow is all you really need for great brisket.